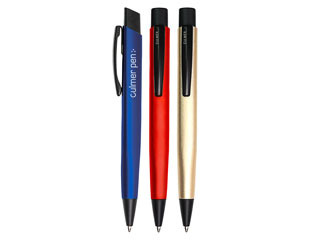 Sturdy push mechanism ball pen with flexible clip. Equipped with a metal, large capacity Parker type refill with blue ink. Available in brushed matte finishes of Blue, Red & Champagne with Black accents. Laser engraving & standard black triangular box included.